Plan your next powder day, weekend trip, or destination ski vacation with OpenSnow. 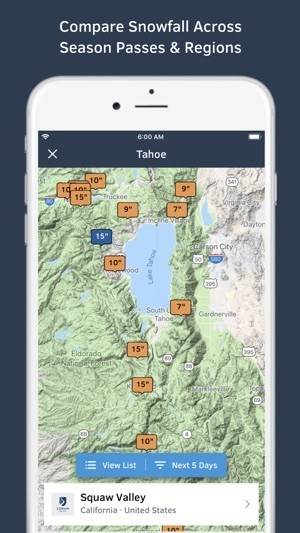 Conveniently displayed on your iOS device, OpenSnow gives you access to the best snow forecasts, snow reports, and live cams for over 2,000 mountain locations across the United States, Canada, Japan, and Europe. 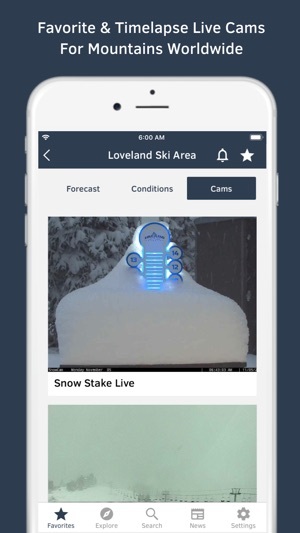 Access Hourly Forecasts for 3 days across all United States mountains, Daily Forecasts for 10 days, Favorite & Timelapse Cams, Custom Forecast & Report Alerts, and Compare Snowfall across Season Passes & Regions. Payment for OpenSnow All-Access entitles you to OpenSnow All-Access usage and its features. OpenSnow All-Access is an auto-renewable subscription, which will renew yearly at $19.99. Payment will be charged to the user's iTunes Account at confirmation of purchase. The subscription automatically renews unless auto-renew is turned off at least 24-hours before the end of the current period. The account will be charged for renewal within 24-hours prior to the end of the current period and identify the cost of the renewal. Subscriptions may be managed by the user and auto-renewal may be turned off by going to the user's Account Settings after purchase. • 'Snow Forecast Summary' on mountain screens. • Pull to refresh on mountain screens. • Snowfall alerts bug fix. • Other minor improvements and bug fixes that you might not notice but make us feel good. Also, if you enjoy the app, please rate it and write a review on the App Store. The UI is also inconsistent with the metrics you get in the free tier - in some places you can see 5 days of weather, and in other areas only 2 (further than that is blocked for free users in both cases). I’m fine with freemium, devs need to make money, but make it consistent. Bring back the single overview of five day snow forecasts of all of your favorites and it’ll drastically improve my opinion of this new version. Best snow tracking weather app out there!!! This is without a doubt the most favorite app on my phone!! 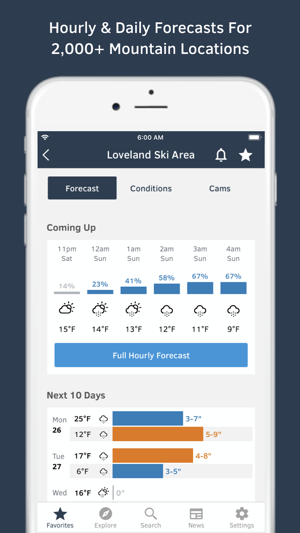 If you love staying up to date on current and future snow conditions this app is for you. I use the current conditions and webcams to plan the night before which local resort I’m headed to in the morning. I use the extended forecast to help plan days off from work in hopes of catching a powder day. 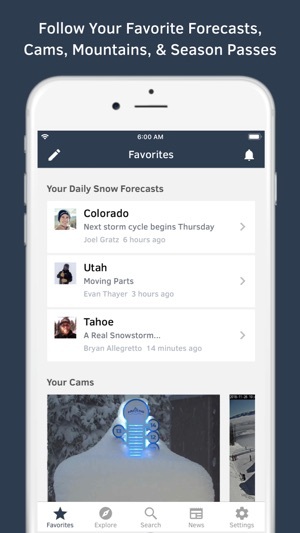 I’ve been looking for a truly great snow report app. And I think this is it. I went back and forth on whether I should pay, but I’m glad I upgraded to the full access. 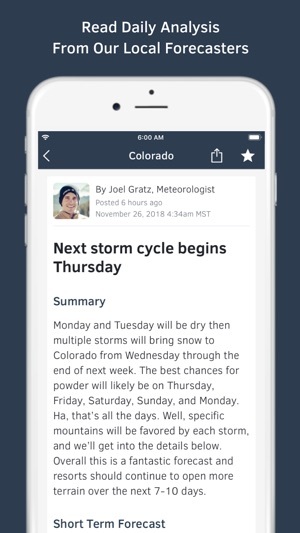 This app has it all: detailed meteorologist forecasts, at-a-glance snow reports and forecasts, webcams, and pass comparisons. I put a pretty high premium on whether to pay the extra when there are so many good, free services ... but this service is great and worth paying for. UPDATE: after a couple months using the app, I am sold. Yes, the premium features aren’t free, but there is a huge amount of work that’s gone into the app. For something I use almost every day, it’s worth it and I’m very impressed. Definitely the best ski conditions app out there.